Ann Crotty bought the Chelsea Record news paper every week. 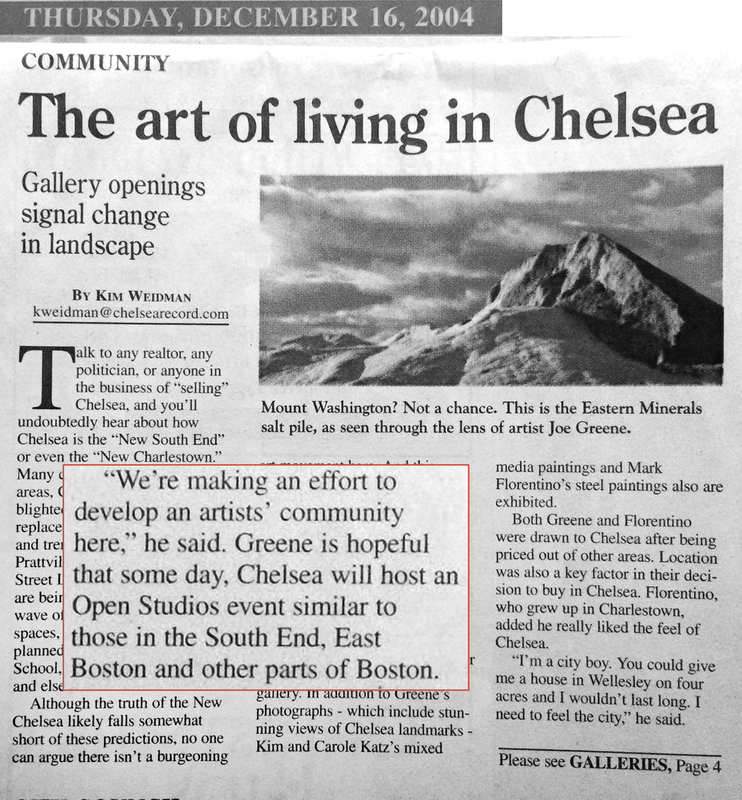 After reading the December 2004 front page story about my relaunch of the Pearl Street Gallery and that I was " hopeful that some day Chelsea will host an Open Studios event…" she picked up the phone and called. " Hello, my name is Ann Crotty and I would like to stop by and tell you all about a Chelsea artists group I was a part of ". How could I refuse? Ann hopped on a bus and came by Pearl Street with a stack of papers, flyers and literature from a lively group of artists in the 1990's she was a part of. As rents increased, those artists had to move out and the group disintegrated. Ann convinced me that this time we could make it work. With Anns' encouragement, I reached out to Chelsea City Cafe and the Gallery at Spencer Lofts. In November 2007 ( and with the arrival of John Kennard ), we had our first group show called " Made In Chelsea ", showing works at both Pearl Street and Spencer at the same time. The show was such a success, that as a group we decided to continue as Charcoll ( Chelsea Artists Collaborative ) and to have our next event in the spring of 2009, the Chelsea Art Walk. It's safe to say there might not be a Charcoll without Ms Crotty! This first Chelsea Art Walk was ambitious and included 9 or so venues all over town. Ann found us volunteers and bus greeters to guide our visitors around the city. As the years went by, Ann was an active Charcoll member and attended nearly every Art Walk meeting with a smile and a story.